The Flight Standards Service of the United States Federal Aviation Administration (FAA) promotes safe air transportation by setting regulations and standards for certification and oversight of airmen, air operators, air agencies and designees. The service employs over 5,400 people and its work impacts the millions of travelers that fly on commercial or private aircraft throughout the United States and the world every day. The FAA has had a well-documented legacy of working complex changes. Recent years has led many government agencies, including the FAA, to recognize the need to become more effective at leading and managing change. The Flights Standards Service internalized this charge and, in 2014, pledged to embed a new mindset, skillset and toolset for leading change. Our goal is to transform the way change is done in government. By changing our mindset and enhancing our skillset and toolset, we are effectively leading change. Prosci’s research-based methodology is supporting us in realizing the successes we’ve seen. To build a foundational change management program to support the people of the Flight Standards Service in developing and sustaining a change-ready organization. When looking for an external organization to support their change management efforts, the Flight Standards Service wanted a methodology that was research-based, that was supported in academia, and that would help them embed change leadership and not just come in with an army of consultants. Prosci was identified as an industry leader and an organization that would come alongside them and help them learn how to lead change. Through planning the roll-out of an enterprise change management capability as a project in its own right (“Project ECM”), the change management group created a clearly defined change management maturity goal and a structured, intentional approach to achieve it. Establishing a tailored Change Management Group structure and governance model for change management support across the service was critical to program success. The Change Management Group also created a unique Three-Tier Service Model to streamline how they support change management application throughout the organization. In Tier One, a project is small enough that those outside of the Change Management Group - such as the middle manager, project manager and frontline staff - should have enough capability to successfully apply change management to the change. In Tier Two, the change is still managed mainly by those outside of the Change Management Group, but a Change Management Advisor will come alongside the project owner to provide guidance and advice. Tier Three is where the Change Management Group gets largely involved. Here, a project is large enough to require dedicated Change Management Practitioner resourcing. The Flight Standards Service has now certified around 40 Change Management Practitioners and is applying change management on all projects. They will also have completed initial training on over 5,400 people at various levels in the FAA by the end of 2018. While they’ve experienced their share of difficulties when internalizing a new competency, more projects have been successful utilizing change management. In addition to growing change competency and a growing list of successful projects, the change management group at Flight Standards Service has also invested in maturing the discipline of change management within the public sector. The FAA began working with the U.S. Navy, U.S. Air Force, U.S. Department of Energy and other government agencies to mutually strengthen their change management practices and skills. This is evolving into a structured community that is working to build a community of practice. 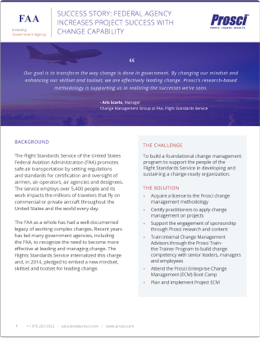 Read the full FAA success story - including how the change team inspired sponsors to own their change management efforts - when you download the PDF. The Flight Standards Service of the United States Federal Aviation Administration (FAA) pledged to embed a new mindset, skillset and toolset for leading change. Read this success story to learn how the FAA change team implemented a foundational change management program with tiered support structure.